Madwomen Perfume Lab carries various kinds of perfumes, body oils and soaps in a range of scents. Kare, the owner of Madwomen Perfume Lab takes pride in making only high quality perfume and products that will delight your senses and strives to exceed your expectations with her products. 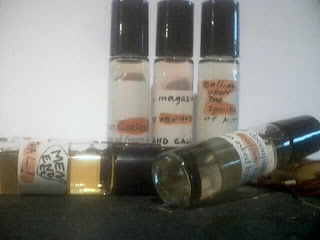 Some of my favourite products in her shop are the Brown Sugar Body Oil Perfume and the French Spice Perfume. Her prices are reasonable too. Folks call me Kare and we reside in Upstate SC 3.5 hrs from the Edge of the World, Folly Beach, where I escape alone as often as possible. I grew up in both South Chicago and South Miami, something about the South that’s karmic I guess. My mate is from California. A few thing I really love are nature, the ocean, gardening, and farming. We’ve been married 20 years and my beautiful hunky man lets everyone know I am his Queen. We are the pets to a pack of 5 adult dogs and are active with Home Again animal rescue. We own a certified mini organic farm. Please tell me about your business. In the 70s, Mom, my little sister and the Aunties used to get together in Mom’s kitchen and drink teas, make soap, and body oils. From this grew a small business where I began knocking on doors and selling my items in Head Shops. I remember my first sale was exactly $60 for some magic lotions, and the Shop name was Purple Haze or something close to that! Life took me here and there but in the 80s I started up with product again, quit, in the late 90s went into making fumes, working with oil blends and making soaps. Today here I am madwomen perfume lab. I love making perfumes, extraction and blending, but I mostly do oils and soaps now. I keep trying to retire from online but I just can’t. I feel compelled to create and so much love working with scents, I just can not retire. And, so here I am.